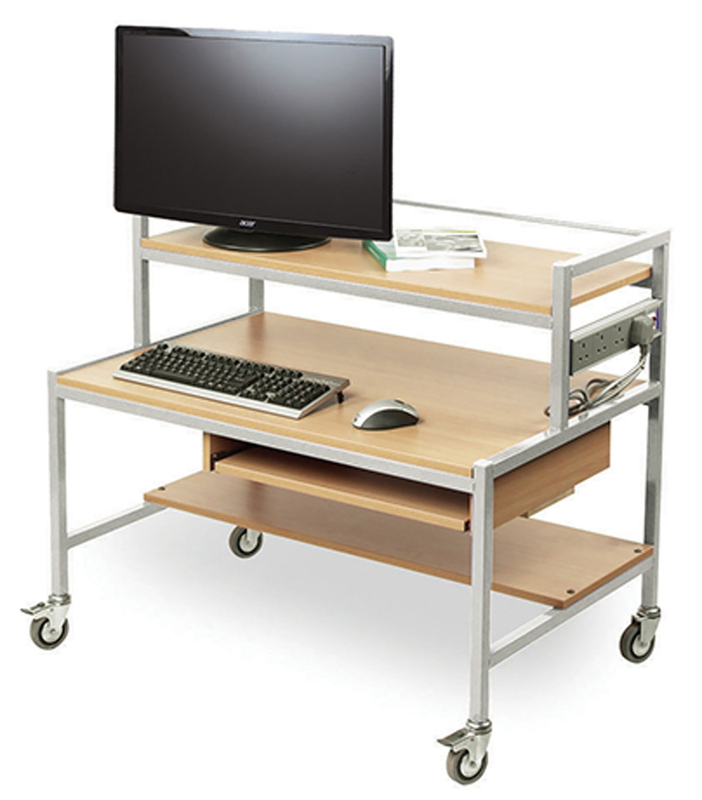 The two tiered computer trolley is a mobile computer desk designed for use within schools. The heavy duty steel frame has been designed to last and is available in red, cool blue or light grey finishes. The beech top is constructed from 18mm MFC and comes complete with lockable castor wheels for easy mobility when required. The two tiered computer trolley has a top shelf which is ideal for positioning your computer monitor on, the middle worktop is ideal for holding work books and provides are area to work if required. Complete with a sliding keyboard shelf and a bottom shelf for addition storage. Included with the school computer trolley is a 4 gang power socket for powering your computers. The computer workstation available in 6 height options - 500mm, 550mm, 600mm, 650mm, 700mm and 750mm from the floor to the main work surface (middle shelf). Please note: this item is non-returnable as it is made to order. The computer and accessories featured in the product images are not included. Please Contact Us or call for more details on 01733 511121. View our full range of Computer Storage Trolleys.